Hello Loverlies! As I was walking through Hastings a few weeks ago, I noticed a new Laurie Halse Anderson book called The Impossible Knife of Memory. The cover is of a blue streaked headed girl, with the wind blowing her hair. It is very eye catching. Guess what?! I actually read the back of the book to see what it was about before I purchased it. I have noticed compared to her other books I have read, it is also an emotional book. 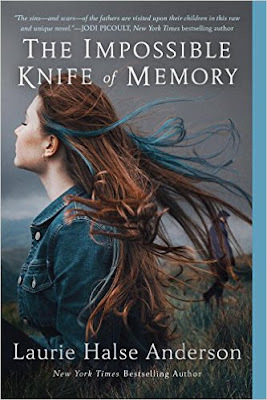 The Impossible Knife of Memory is about a girl named Hayley and how she deals with the struggles of her fathers PTSD from being a war vet. I found the characters very interesting to read and learn about, and I was especially curious how her relationship with her dad would play out. Also was interesting learning about her friends struggles and what would happen with them. In the back of the book it explains why Anderson wrote about this story. It is a story that is easy for her to connect with because her dad was a WWII veteran with PTSD. I really enjoy when authors write about these subjects. It helps those of use who have not been through it, understand what it's like to be in these situations. That way we can possibly try and help a little better, then if we didn't understand what they are going through. This book is a great book to own and go back and reread. It is very easy to connect to the characters and stay glued into reading it. Have a Blessed Day!